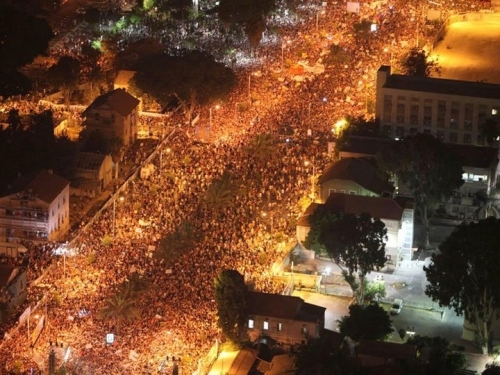 Largest rally in Israeli history sees four percent of the population out in the streets — that would be 12 million people in the streets of the US! According to Haaretz, Netanyahu immediately tried to play down the protests, saying the media had inflated the numbers. But the only numbers that are being inflated appear to be the economic data from Netanyahu’s government, according to which Israel is doing great. In reality, the country experienced home prices jumping some 35 percent between 2008 and 2010. Because wages remained stagnant, many families have simply been priced out of their homes. Years ago, current President Shimon Peres warned that Netanyahu’s economic polices would lead to “6,000 millionaires and 6 million beggars.” In recent years, his gloomy predictions appear to have materialized. Israel is now the second most unequal country in the developed world — behind only the United States. And with many middle class families spending half their income on their rent or mortgage, it was just a matter of time for the outrage to surface. After three weeks, there are signs that the internal cohesion of the protest movement (which is broadly representative of the Israeli middle class) might be fracturing into progressive and nationalistic cores. In the protest camps, Jewish supremacists increasingly clash with left-wing protesters demanding more attention for the Palestinian question. 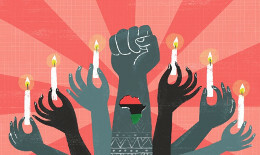 Some progressives are demanding the removal of racist and fascist elements within the movement. The swelling of the protests comes at the same time as anti-neoliberal protests in Spain and Chile have reached new heights. From Latin America to Europe and the Middle East, there is something in the air. 2011 is still in full swing.